This weekend I have been working on the mizuya. 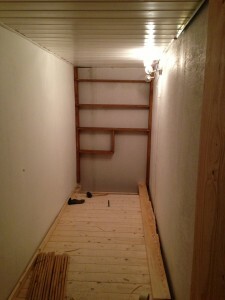 I started out making some shelves above the preparation area. They did not turn out the way I wanted them. The wood I used was not nearly wide enough, and the spacing of the shelves is all wrong. The shelves should be easy to replace after the rest of the mizuya is done. However, I think I will redo them as soon as possible. I need to find someone that can give me the proper measurements for a mizuya shelf. 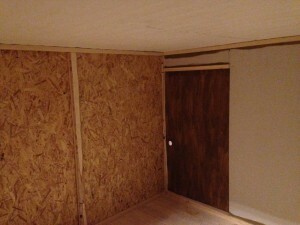 I want to get the carpentry done with so I can start using my new room. Even if it is several weeks until the tatami are due to arrive, I think I would enjoy to have Tea in my room using my two old mats. I have been painting, painting and painting the last few days. The first walls were easy, as I could remove them from the sliders and just place them on the floor to paint them. The sand looked really nice on these. The walls that could not be removed was more work. There I had to mix sand into the paint, and be careful not to paint the birch. After two coatings the room looks almost finished. I got some feedback from a friend in Kyoto that I should have placed the main window differently and have made it bigger. I’m still waiting for details. This is also the only wall segment that has not been painted. Behind the left walls when entering the Tea-room I have some storage space. I had not thought about the size, since the layout of the room pretty much dictated how it would be. I have brought all the Tea items I own down, and I could just fit all the boxes in the storage area 🙂 Which means that it will be some free space in there as soon as I start putting items out in the mizuya. Another day working on the Tea-room has come to an end. 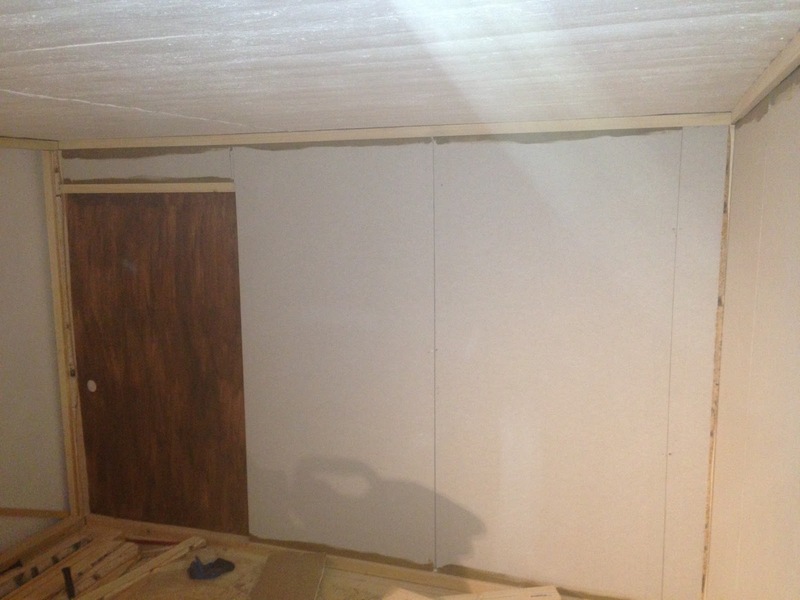 Today I got the walls up for half the room, the most tricky half I believe/hope. It’s a bit hard to tell from the image that something has changed as the wall plates are almost the same colour as the wall were yesterday. I still need spackle the seams between the wall plates before I can paint them. Also got the combined guest and host entrance to the created. I decided on making it brown even though I’m not going to use that colour for any other elements. I need to make a nice door knob. Now it is just a gaping hole. Do you happen to have some spare bamboo that I could use? Need a piece that is 6-7cm in diamater. I only need a few cm worth of bamboo around the node. Things took much longer time than anticipated, again. But at least I do not see any very difficult tasks that has to be done tomorrow, so hopefully progress will be better. Started early today. I was at the hardware store just minutes after they opened. I needed some new tools to move forward with the project. Got a jigsaw and a sanding machine along with some other small things. Spent half a day and all I really had to show for it was one fusuma railing fastened to the ceiling. I had such a hard time getting it up there! After lunch I felt more productive. It was much quicker to get the remaining railings up after that first tricky one. At the end of the day I had all railings fastened to the ceiling. Also put inn a small section of the wall above the door, just to see how my system with grooves for the walls would work. I’m very happy with the result, the wall section fit perfect. Though it need some colour and texture before it’s done. Looking forward to placing more walls tomorrow. Finally I gave the white birch pillars a quick wash with some mould and algae disinfect. I still remember last time I used self-cut-wood in a Tea-room. I made a nice tokobashira, and after a week it was covered in mould and had stained a tatami. This time I’m going to be proactive and disinfect it in advance. Hoping to avoid all any mould. I got two horizontal pieces of wood above the door. The lower one will only be visible above teh door. The rest of it will be hidden. I had to have two railings to avoid a electric junction-box that would have blocked the door. I finished the last of the grooves early this morning. Then I headed back home from the mountain. I had a few very nice days in the mountain. I got all the wood I needed in addition I had two very nice cross country skiing trips. Back home I got all the wood safely down to the basement. I focused on cutting the wood for holding the fusuma today. Was almost able to complete it. One of the pieces had been made 8cm wide when it should have been 6,1cm so I have to cut it tomorrow. Also I apparently had made a counting error because I had a few more pieces than I needed. 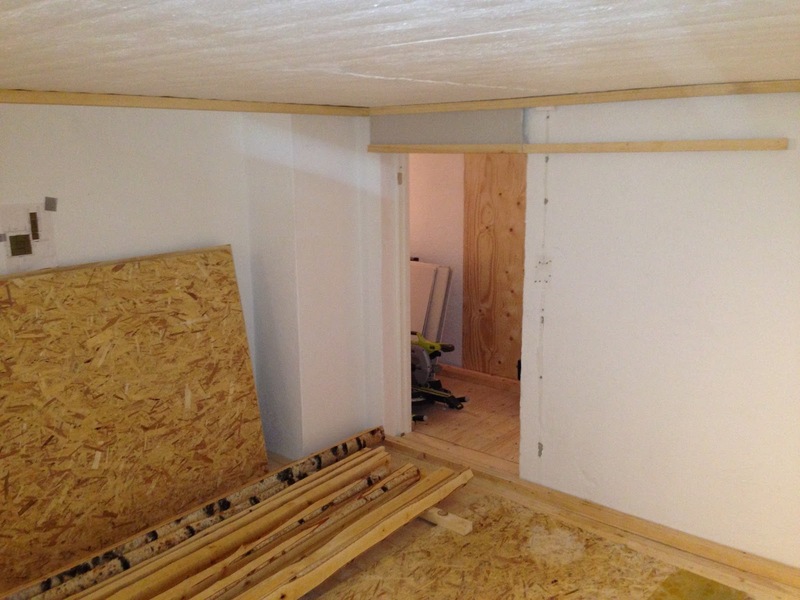 Anyway it is nice to see the outline of a Tea-room taking shape. On the photo you can see that the railing for the entire room is placed down. 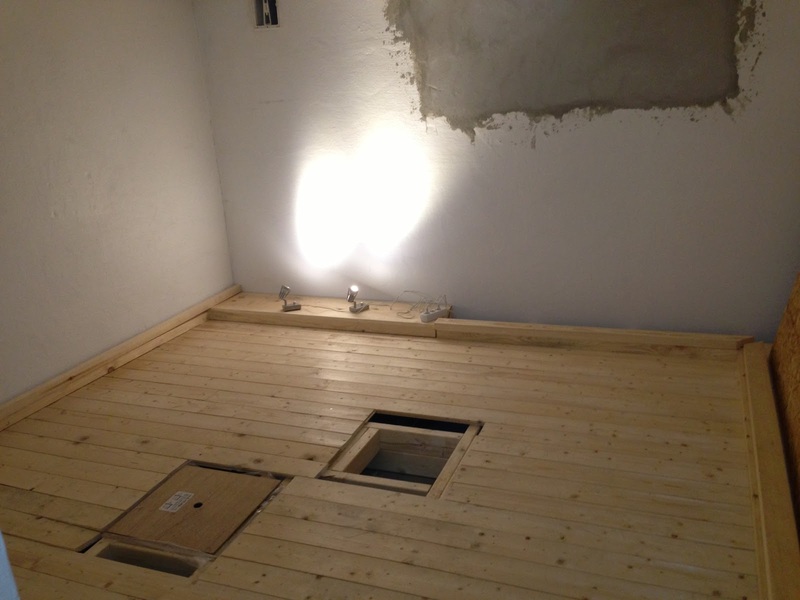 The floor pieces has been fasten, while the ceiling pieces are just placed on top. One nice detail is the tokonoma piece. It is one huge chunk of wood. Even got the bevel on the front. It’s not 10cm thick so I can’t leave it at the floor like it is now. 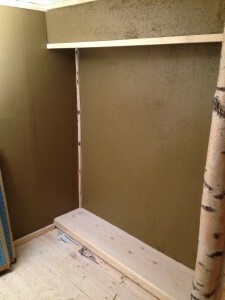 I need to lift it a few cm so that it is 5 cm above the tatami. Was back at the lumbermill again. 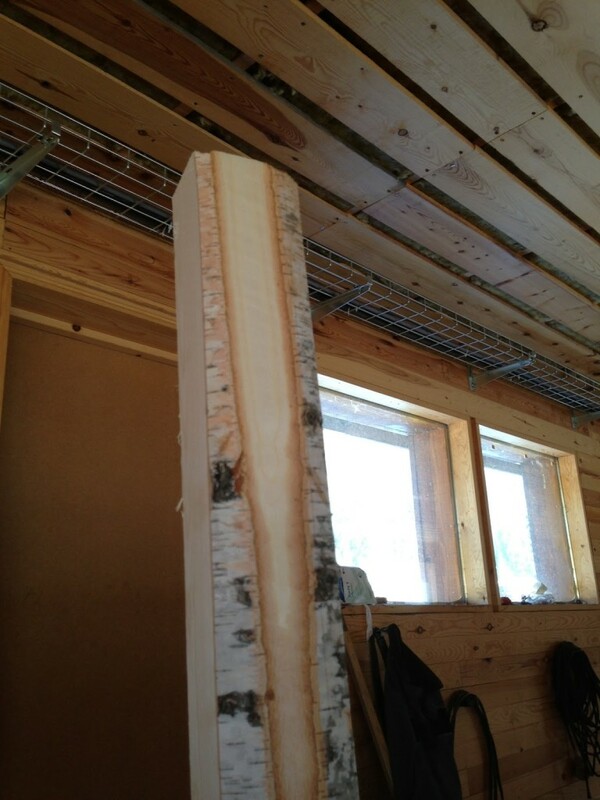 At the lumbermill I found a piece of wood that looked like I imagined that mine would look. That is pine with bark. So I made this image with the left part showing what I thought I would have and the right showing what I got. Spent a few hours making grooves, but was unable to complete the task. I had planned to take my little brother skiing tomorrow, but looks like I have to spend that time at the lumbermill instead. Tomorrow is the last day I can spend at the lumbermill. I’ll be taking my new and “shiny” wood on a four hour drive back home. Spent a few hours at the lumbermill today. Originally the plan was that one of their guys was going to make the grooves that I need for fusuma and walls, but that ended up not being possible. Today I made about half the grooves I need using their equipment. It’s a tedious task, but it has to bee done. I got all the sliders for the roof done today, and need to do the floor ones tomorrow. to cut down a few white birch near to the mill. He brought a chainsaw and forklift. Suddenly we had more raw material than we needed. Another guy at the lumbermill operated a huge saw that cut the trees into square pillars. Usually he does everything he can to get teh corners 90 degrees with no bark showing. Today he did a fabulous job of cutting the pillars so that just enough bark was showing in the corners. I’m very happy with the look of the finished pillars. I think they are going to give the room a nice touch. 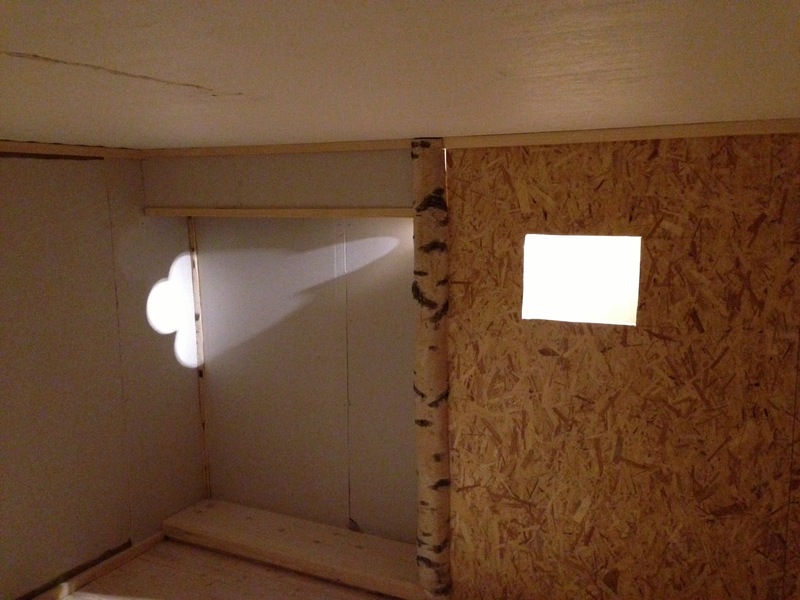 Also it will give the room a bit more the look and feel of a mountain hut. In my mind the pillars would be pine with dark bark. However, I ended up with white birch. This changes the colour composition in the room. 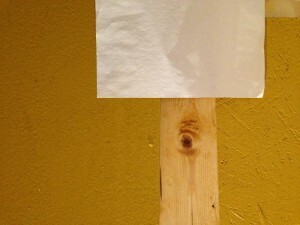 With this in mind I feel it more appropriate to just lightly color the wood. 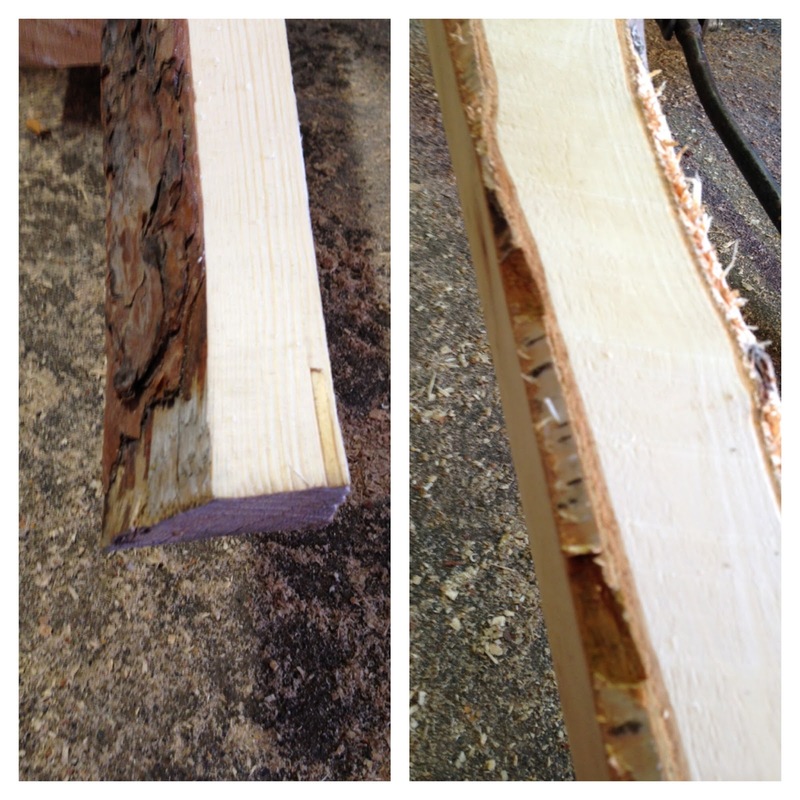 Tomorrow I’ll be back at the lumbermill to finish the grooves. Very much looking forward to getting back home to try and assemble it all, but first there is a few days of skiing in the mountains. Hopefully I’ll have some nice photos of the room on saturday. Did a colour test the other day, now I need to figure out how to get the texture of the wall right. The only place I could think of that would have sand in many different granularities was the aquarium shop. My local aquarium shop had a granularity I liked. I have tried two different ways of applying it to the surface. 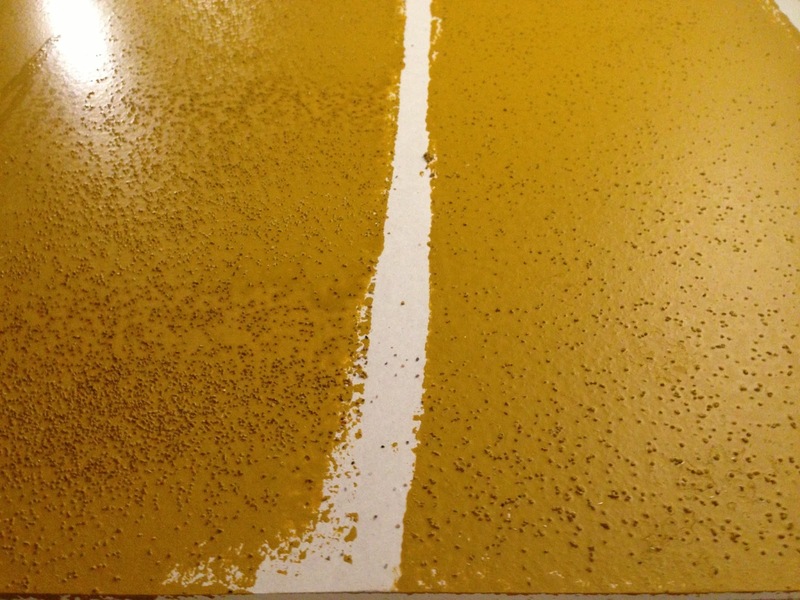 In the left trial I painted the surface and then sprinkled the sand onto the wet paint. After the paint had dried I painted it once more. In the right trial I mixed some sand into the pain. I painted twice, both times with sand mixed into the paint. 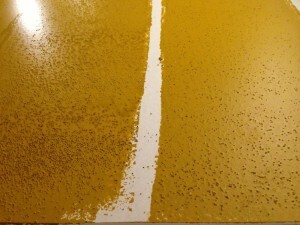 The end result was much the same, however I liked the control I had when I sprinkled it on the wet paint. I mentioned it the other day, that I wasn’t 100% satisfied with the colours I had bought. So I have been out getting some new colours to try. Starting from the right side and going left. First I got the original wall colour that I think is too yellow. Than there is a small patch that is a bit darker. This is the original paint, but I got the shop to add more black to it (for free). It is better than the original. Next is a trial for colouring of the visible wood in the room. I’m thinking of corner pillars, sliders for fusuma and such. I had one earlier that was too light, so I’m trying something darker now. It became more grey than expected. The lower part has two layers, and the top only one. Next is a new colour for the walls. It is a bit darker and much less yellow than my previous trials. I like this much better than what I got before. Finally I got one last attempt at the colour for the visible wood. This time it is brown with one layer at the bottom and two on the top. This is more the colour I envisioned that the wood would be, but the grey one is kind of growing on me. Please use the comment field and let me know what you think. I’m not a 100% certain that I have chosen the correct colour for the walls. 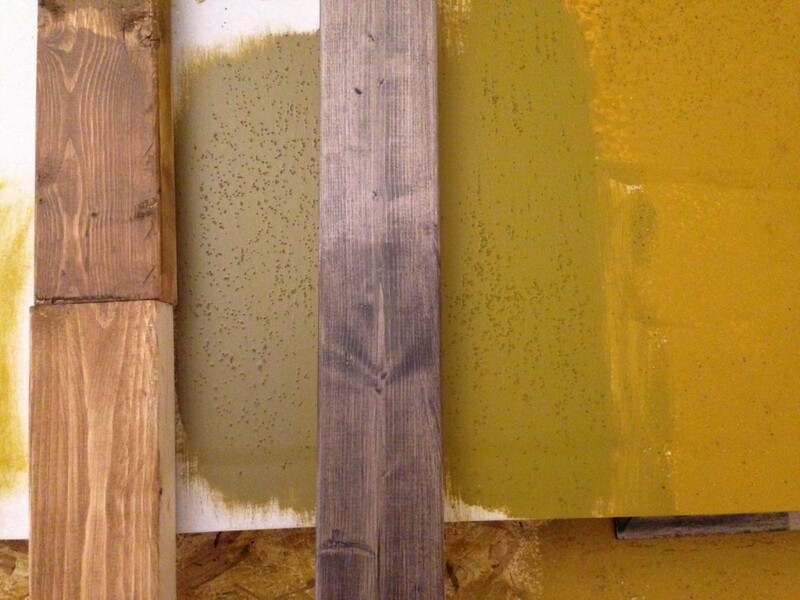 The image show how the two type of wall material will look with two layers of paint. 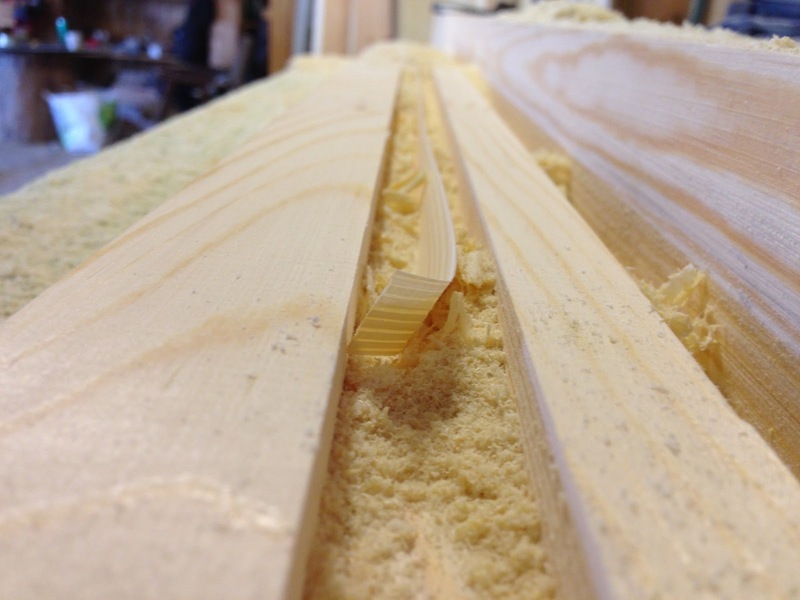 The piece of wood in the middle is a sample of how the corner posts will look. I’m not happy with that colour. Not nearly dark enough. I need to find a different way to darken the corner posts to obtain the colour I want. Today nothing was done on the room.